I took the concept of In and Yo for granted. 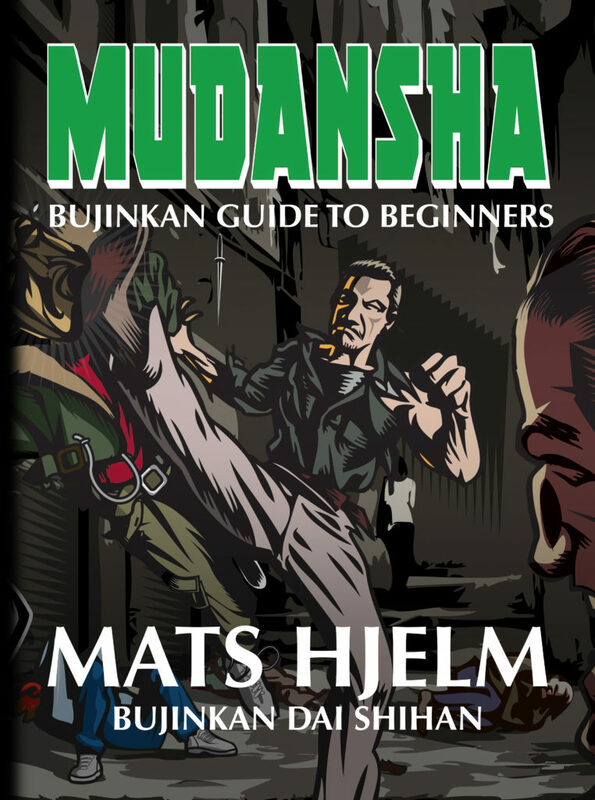 I had heard about this idea since I first began studying the Bujinkan in the mid '80's. But my mind always glossed over it. I was like yeah, yeah, In Yo - dark and light, yin and yang, positive negative - i get it. They are opposite but the same. Now show me that cool sword draw again! But I didn't get it. Maybe I needed more life experience to understand. Maybe I needed a teacher who could do more than just talk about the concept but one who actually lived it. Whatever it was, I now find myself feeling like a beginner being inspired by this concept as if for the first time. "The two guardian gods take the form of In and Yo. The movement of their fists, and also the breath." Hatsumi Sensei changes the kanji to help us understand that this sacred song (seika 聖歌), can only be understood if we make it a living song (seika 生歌). How do we make this idea come alive? To begin with, don't get lost in the philosophy. The symbolism in our art also has a real physical manifestation. I mean, you can use it in a fight. 陰 (In) can be shown by tranquility and inaction; and 陽 (Yo) can be shown by movement or action. Before fighting, you should have a calm exterior(In). While your mind remains active and alert (Yo), flowing yet fixing on nothing. When attacking, your body goes into action (Yo) while your mind should stay calm and quiet (In). These flow from one into the other. 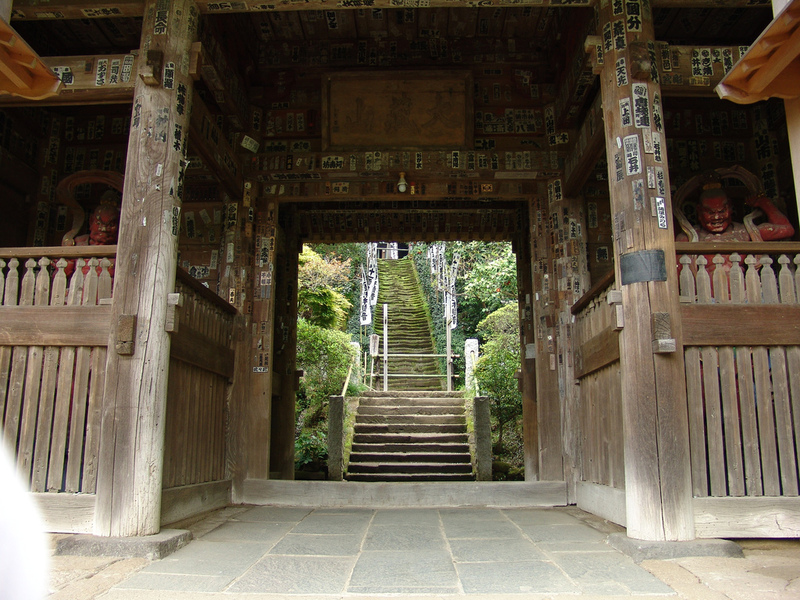 In the Gokui song the two guardian gods are the Kongou Rikishi or the Niou 仁王尊, shown in the temple gates in the photo above. They represent the use of overt power and latent power. Naraen is also called Narayana. As a pair, the Niō complement each other. Misshaku (aka Agyō 阿形) represents overt power, baring his teeth and raising his fist in action, while Naraen (aka Ungyō 吽形) represents latent might, holding his mouth tightly closed and waiting with both arms tensed but lowered. The one opens his mouth, in the "agyou 阿形" position (the shape of mouth saying "a" あ ) and sometimes holds a thunderbolt, while the other closes his mouth, in the "ungyou 吽形" position (the shape of mouth saying "un") and may hold a large sword . "Life & death are connected. Like in-yo (yin-yang). This is my teaching theme for the year. Like a magnet and metal, life and death are attracted to each other, always getting closer. If you are born and given a life, death is inevitable. When death comes do not be surprised or shaken. Get on the rhythm of life. Get in balance with it." This connection is like a rope or a spider's thread that you don't want to break. If you try to unravel In and Yo they dissolve and harmony dissolves with them. One is necessary for the other. In fighting, If your body is active (Yo) and your mind is also in motion, you can become uncoordinated and easily defeated. This is like lashing out with a mind clouded by anger or fear. Conversely having an inactive body (In) and inattentive mind is like being caught off guard or being helpless and incapable of fighting. Better to have one connected to the other so that as one shifts the other shifts in harmony. Hatsumi Sensei recently described the Godan test as having a connection from the Kami above down through the upraised sword and heart of the person cutting... connected down to the heart and spirit of the person sitting. Neither person should sever that connection if they want to live through the test. 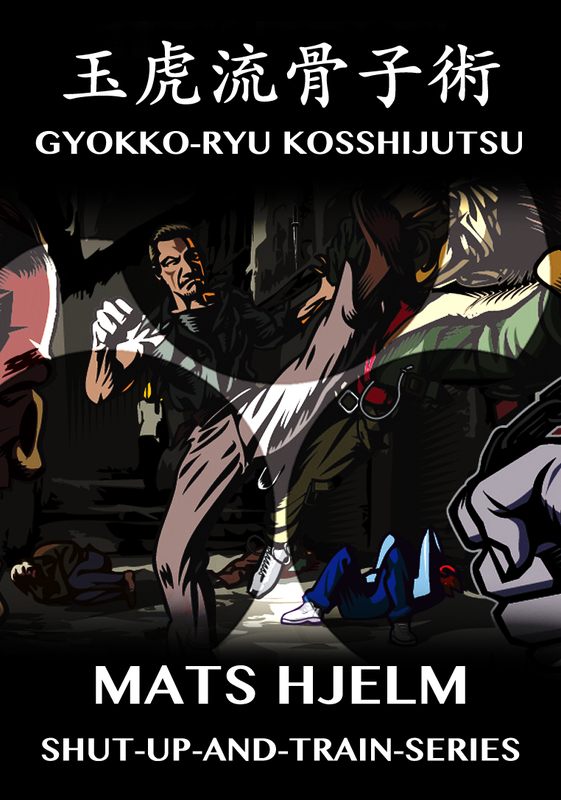 "No technique or form, no yin or yang, or kyojitsu. Go beyond this. 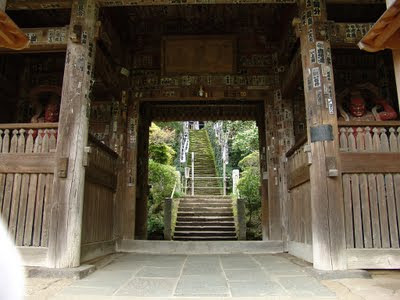 Do Kamiwaza. I teach things you shouldn't be able to understand." This gets us to the real secret of InYo. As in the picture of the temple above, you have to pass THROUGH the middle and beyond In and Yo to get to the true meaning inside. Don't be frightened by the fierce expression on the temple guardians' faces. Just walk through the gate. I've been exploring this in my life and in my taijutsu. Allowing the inside and outside to be as one. Keeping this connection from above alive and fluid has made for many wonderful techniques in my training, but also creates moments of wonder and surprise in my life. But it's not me doing it. It's just part of the natural flow. "Look eye!, always look eye!" Very good advice for self defense. But there is a lot more to be understood about the eyes in our training. And, despite my fondness for that simple time in my life when a movie meant so much to me, I will break from Miyagi Sensei to suggest you don't always look eye. There is a lot of psychology in a glance. A lot of nonverbal communication that takes place before a fight. Looking someone in the eye can be perceived as aggressive and create tension or make you a target for their anger. At the same time, the right type of look can cause the opponent to back down. 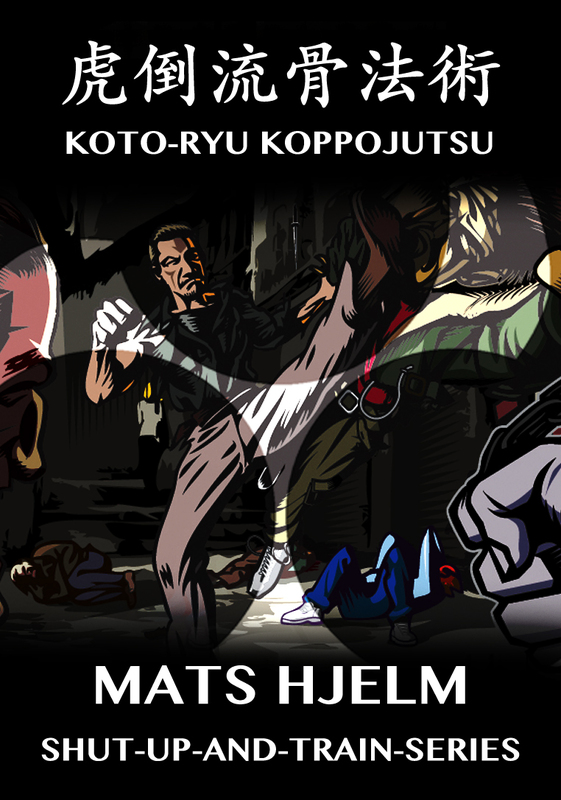 Takamatsu said that truly skilled martial artists can decide a fight by looking at each other. The better fighter knows he is better and graciously gives his adversary an opportunity to back down. If the weaker has any skill at all, he will perceive his opponent's superiority and concede to him. A proverb says that the eyes are the window to the soul. This creates weaknesses and opportunities. If, you give away too much in your own eyes, your opponent can see your bluff, or know what your next move will be. Or, if you look in his eyes and see fear. You could easily reflect or manifest that same fear in yourself. "to cloud the mind can be another important way of blinding the eyes. I would like you to know that it is the core of the metsubushi techniques to make the eye stop working." This brings us to a more advanced use of the eyes for mind control. Ganko Issen is a sudden flash or glint of light of the whites of the eyes which can create the effects of Fudo Kanashibari and is also a basis for Toate no jutsu (striking from a distance). Hatsumi Sensei says that it is possible to "see" without using the eyes, and to "hear" without the ears. He says that, "In Ninpo your whole body must act as your eyes and ears." This brings us to the concept of 偸眼 Chugan - looking askance; pretending not to look, or stealing a look. Maybe another word for it is tōshi 盗視 or 偸視 a stealthy glance; furtive glance. 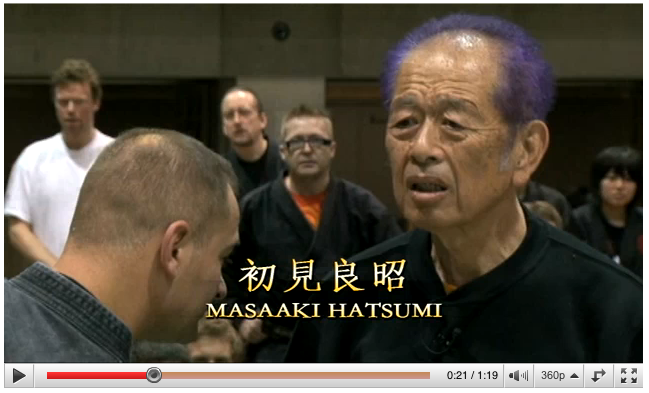 I see Hatsumi Sensei do this all the time. In fact he often advises us to do this. With a pilfered glance, the dragonfly evades the shrike. This idea has many layers. 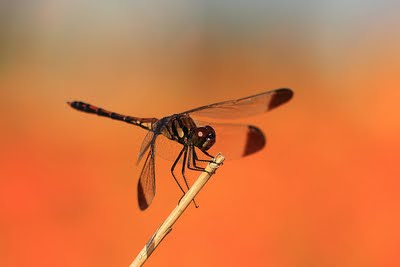 One is that by not looking directly at your opponent you can make your focus broader to take in the whole environment. People and animals often do this naturally when surrounded. Looking nowhere but everywhere. This can be called Happo Nirami (staring in all directions). One benefit here is that your opponent's actions will be caught in your peripheral vision which responds very well to sudden, quick movement. Another layer is that you can confuse your opponent by shifting his mind along with your line of sight. This can be simple misdirection like looking at one target on his body with your eyes but attacking another. As in 二目遣い Futatsumetsukai from Noh theatre which is a double glance where you look first but your mind does not stop there; or you look at your opponent when you appear not to be looking. But it is also something more profound. When he attacks, especially if done with anger, he is looking to confront another soul directly. By shifting your awareness, it is like you are sidestepping his intent (like shifting your spirit back at 45 degrees) and his attacks will dissipate when they encounter nothing. Hatsumi Sensei is constantly saying things that allude to this concept. Like "dissipate" the attacks, or you just "disappear" in the face of the attacks. Become zero. Thank you Miyagi Sensei. I was sad when actor Pat Morita died in 2005, but his lesson is immortalized on film. And I'm sure he would agree, acting is all about the eyes. Neither strong or weak, soft or hard, separate from the heart of these and enlighten yourself to the one character of nothingness. Make your body nothingness and reside therein. This comes to us from Toda Shinzaburo Masahide of the Togakure ryu. Another translation of this phrase can be found in Hatsumi Sensei's book, "The Way of the Ninja,"
"One should be neither strong nor weak, neither soft nor hard. Leave such thoughts behind, awaken to the Void, and make your body Null to abide by this." Paul had us exploring these ideas through 虚実 kyojitsu, 無心 mushin, and 縁 connection. Paul explained that for kyojitsu to be effective you have to sell it. He likened it to a magician performing an illusion. In order to sell it, he has to believe in it himself. In the world of magicians this is called misdirection. The next day Paul and I shared our personal stories as magicians with each other. We both studied and performed magic when we were younger. It was a lot of fun sharing memories on prestidigitation and coin sleight of hand methods. With kyojitsu you can show the kyo to the opponent (misdirection) and then you hit him with the jutsu. The interesting part is, if he doesn't fall for the kyo, it becomes real- it becomes the jutsu. Maybe it was never fake to begin with? It's not whether you're good or bad. If you think you've reached a certain skill level then you probably haven't. That's why there's this saying, strong or weak, it doesn't matter. You have to have the balance of these points (heijōshin 平常心). In Zen, Mushin is the thinking of the body. 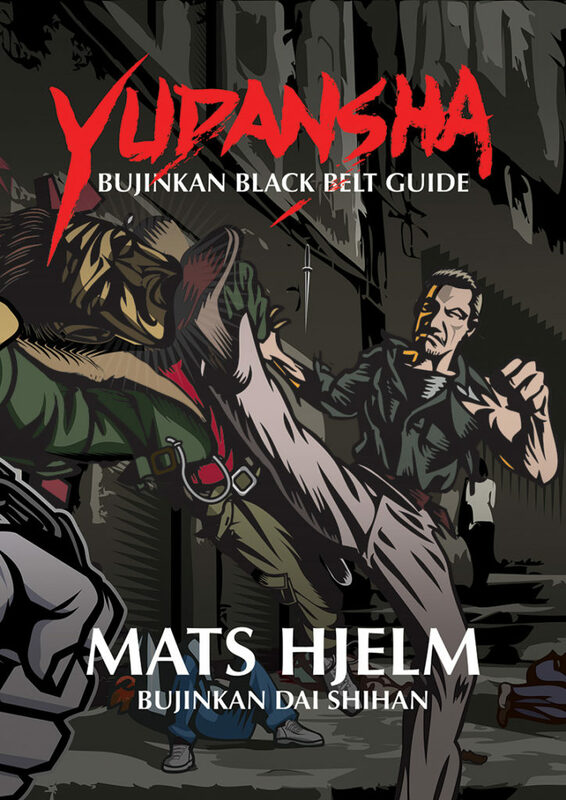 In the Bujinkan we often describe this as flow. And it is obvious when watching someone whether they are doing technique from their heads or from the wisdom of their body using flowing taijutsu. 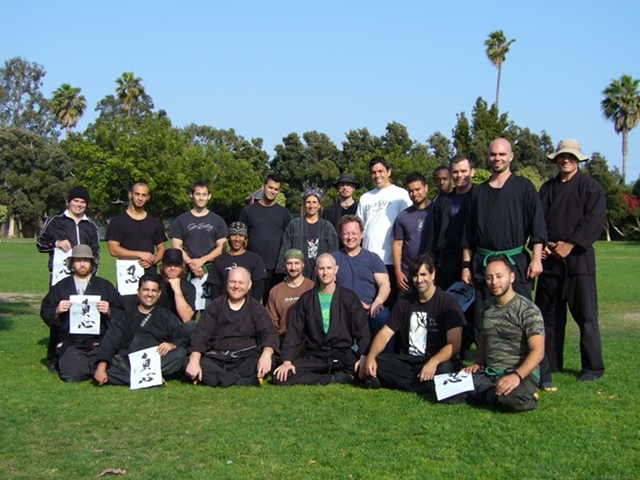 "This means that in Budo, it is naive to get caught up in thoughts of strong weak or soft/hard; in the end, even concepts such as skillful/unskillful simply fade away, Jutaijutsu contains fifteen strong arts and fifteen weak arts, making thirty in total, which can be seen as three sets of ten (as in Sanshin no Kata: Tenchijin and the Juji idea). Nevertheless, one deliberately and willfully eliminates all of that to make oneself Void." Mushin is like looking at your own reflection in the moonlit water. If the water is still, maybe you see the moon reflected there with your own shadow. You might forget that the moon is in the night sky behind you! Don't trouble the calm water with your worries and doubts. Allow your mind to fill the sky and be with the moon. This type of connection to heaven is something Soke reminds us about constantly. Thank you Paul! It was all like a dream (夢 yume).